Only a small number of amps sold have Bluetooth as standard, which makes the Tone:Link the perfect accessory for any musician. Priced to sell in volume, they are an ideal add-on sale. 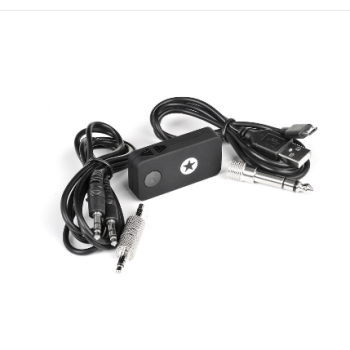 Blackstar’s Bluetooth Tone:Link is the easy way to turn any amp with a line in, into a wireless stereo audio receiver. With it, you can listen to audio or jam along with tracks without the inconvenience of cables. It is designed for guitar amps, PAs, mixer desks, AV systems, home stereos, headphones, car or motorcycle speakers, boats and more. If used with phone it is an easy to use, hands-free Bluetooth speaker for vehicle systems. Two-link: can connect two Bluetooth devices at the same time. Long distance reception, more than 20 metres in open spaces without obstacles. Super clear audio. Supports mobile, laptop, phone, tablet, or any device with compatible Bluetooth. Built-in Li-battery with low power consumption for long use. Cables and connectors supplied. Working time: Up to 8 hours music playback or continuous with Micro-USB charger.